I am a huge proponent of teaching children art and art appreciation. I believe children should not only experiment with art in its various forms, but also be reared in art museums and galleries from a young age. I’ve always believed art helps people grow intellectually and be more attuned to their creativity and intuition. At least that’s what art has given me. Since I let my daughters delve into art each day, I was thrilled to receive a box of soy crayons from Boulder, Colorado based Clementine Art. I have never purchased soy candles before; I’m pretty much a Crayola mom. But I must say I was thoroughly impressed by the quality of the Clementine Art soy crayons and am even more impressed by how safe they are for children. It’s funny because I’ve known for quite a while that soy crayons existed, but I didn’t know what their quality was, so I’ve simply stuck with Crayola all my life, but it’s clearly time for a change. 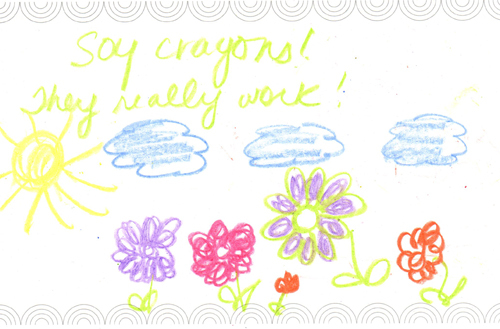 Not only are the crayons safe and non-toxic, Clementine Art also believes in being great stewards of our planet by using recyclable boxes that are made with wind energy. In fact, they say they use recyclable, reusable, and earth-friendly materials whenever possible. I love that more than the amount of years I’ve used conventional crayons and art supplies. In addition to the soy candles Clementine Art carries a wide range of non-toxic art supplies including natural clay, markers, paint, and glue.